Plan on throwing a fun party this summer? Well here are some of my favorite DIYs and outfits for an awesome party! One of my favorite party DIYs is an ice cream bar! How fun would it be to have all your favorite toppings and ice cream laid out for your friends and family to enjoy. And of course I had to incorporate pineapples! Pineapples and watermelons are killing it this summer, and what would a summer party be without adding those into your decoration and outfit! Another awesome DIY is fruit popsicles. I have seen so many recipes and videos showing some of peoples favorite homemade fruit popsicles, and they just look too delicious to pass up. And hey, it’s summer so it’s bound to be a bit toasty out, and what better way to cool down than with a delicious kiwi popsicle! This mood board was inspired by PaperLess Post’s fantastic invitations! Their watermelon invitation is adorable and makes me want to throw a party just so I can get the invitations! Click here to check out all of their cute cards! I am literally obsessed with all of their invitations, I wish I had enough reasons to throw parties just to use all of their cards. What are your must haves for the perfect summer party? 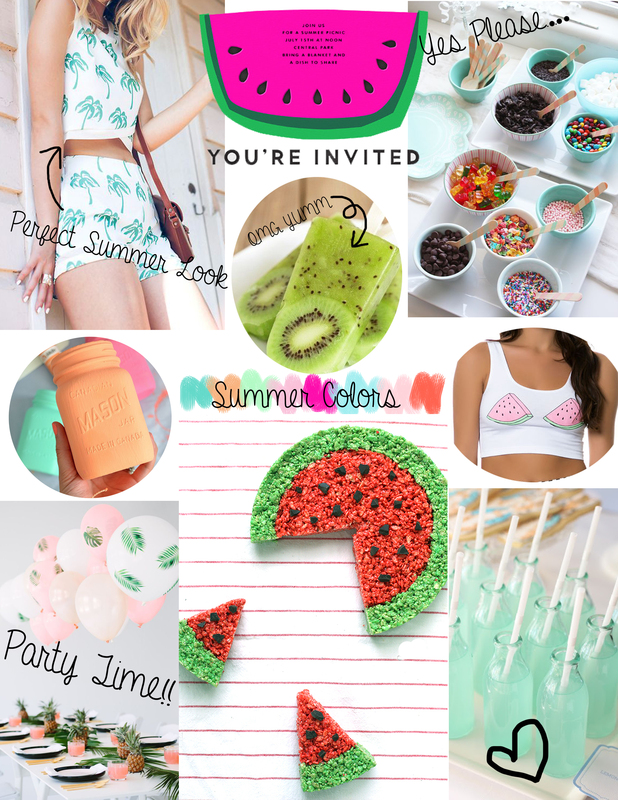 All of the images shown on my mood board were taken from Pinterest, to find out where to purchase these items and how to make them, check out my Summertime Party Pinterest board. There are lots of other cute and fun pins for you to enjoy.